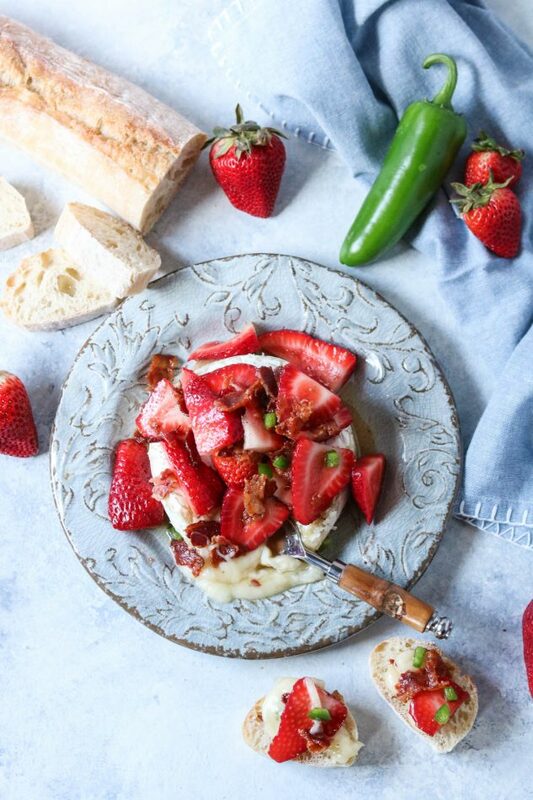 I love summer; fresh fruits and nights on the patio with tasty appetizers like this strawberry bacon brie. I love an appetizer that combines sweet with savory, is simple and packs a lot of flavors. As I’ve grown to embrace the inclusion of fresh fruit with savory dishes, I couldn’t wait to create a summer brie plate to enjoy. Recently my husband and I visited a winery and enjoyed a fresh charcuterie board that included brie with fresh fruit and it was amazing. Of course, that got my chef brain turning and the result was this sweet, savory with a hint of spice summer appetizer. 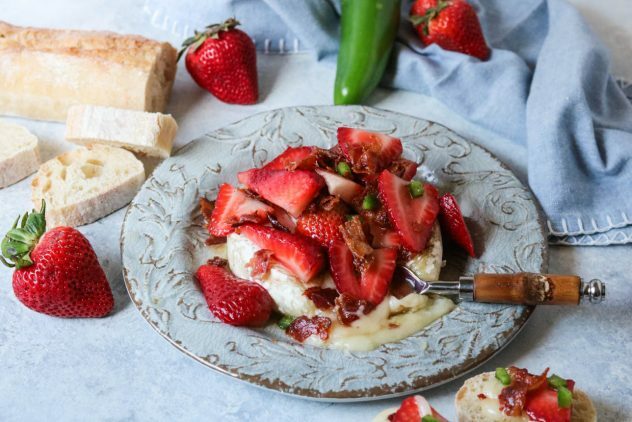 Fresh strawberries, a hint of jalapeno, and bacon, all enveloped in fresh maple syrup and piled atop baked brie equaled tasty perfection. You can enjoy this with a fresh baguette, crackers, pita bread, or whatever you’d like. Welcome to flavor town! Did I also mention this pairs really well with a light, fruity wine? So good! Imagine yourself now, relaxing on the patio in the evening, with a fresh glass of wine and this strawberry bacon brie. Perfecto! 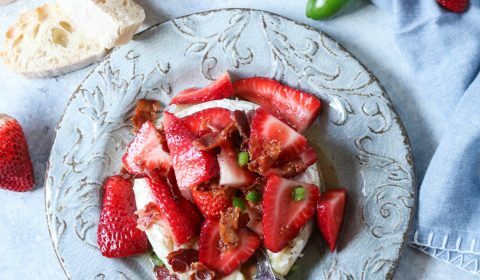 This strawberry bacon brie is the perfect summer appetizer to enjoy on the patio with a cold glass of wine. Place the brie wheel onto a baking sheet. Once the oven is preheated, cook for 15 minutes. Remove from oven and let cool for 5 minutes. While brie is cooking, cook bacon, remove, let cool, then crumble. 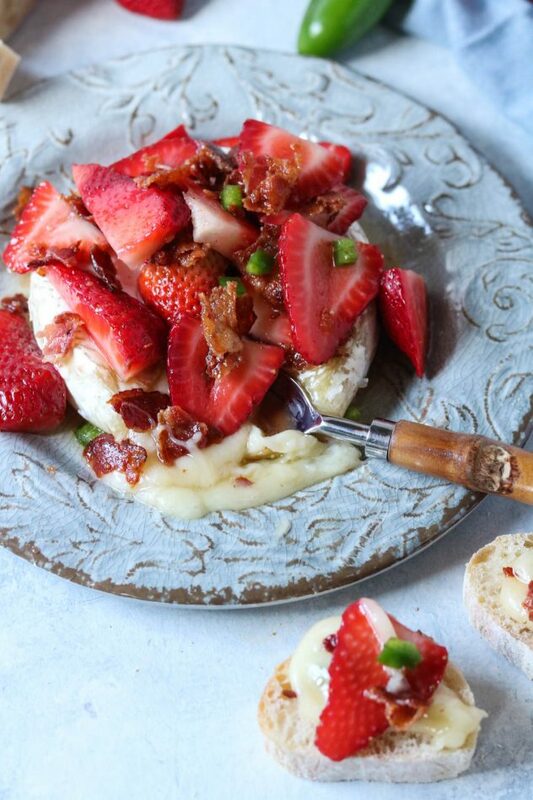 In a small bowl, combine sliced strawberries, bacon crumbles, maple syrup, lemon juice, and chopped jalapeno. Stir to combine. Carefully transfer cooked brie wheel to a serving plate. Top with the strawberry mixture. Slice baguette and serve. If preferred, toast the baguette prior to slicing.